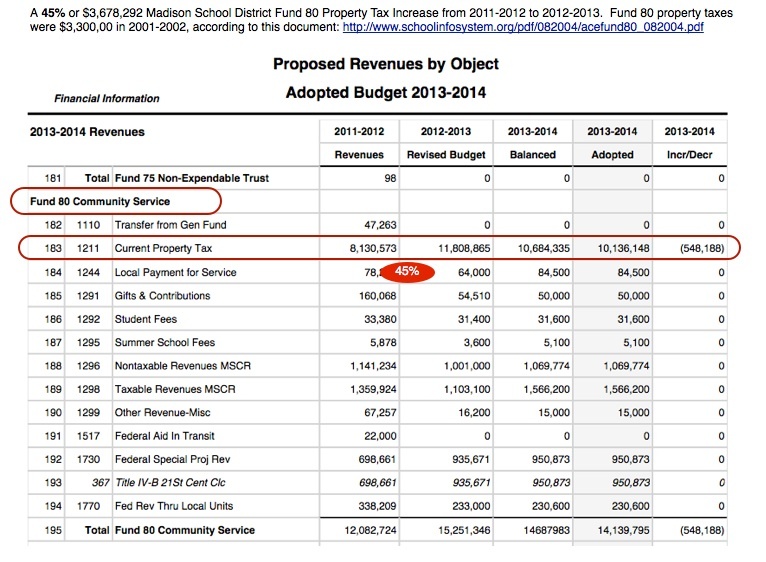 Madison Schools’ 2014-2015 Budget Forecast 1; “Same Service” or “Cost to Continue”; “intends to go beyond marginal refinements”. This budget forecast and those that will follow are intended to keep the board informed as the budget development process unfolds. The forecasts also provide an opportunity for board discussion and input into important budget development issues. 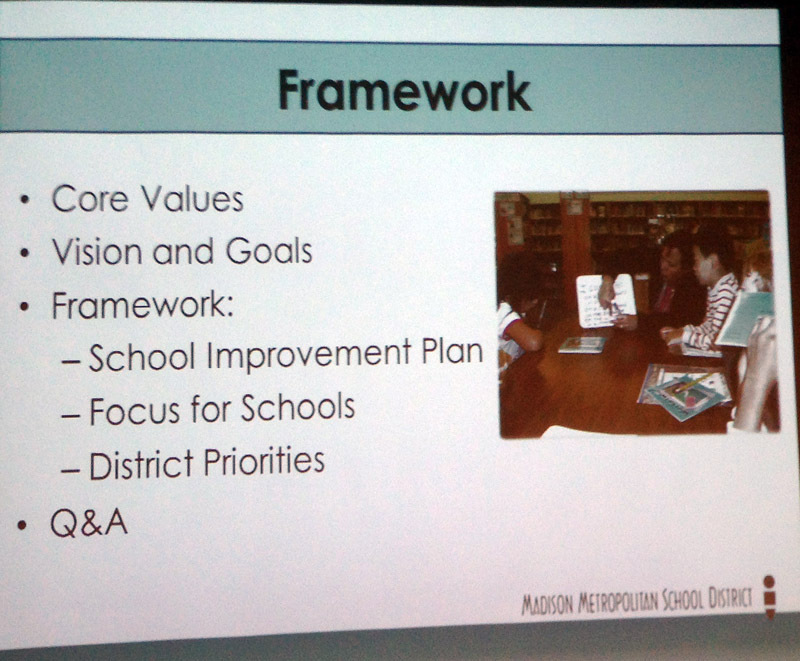 MMSD’s Strategic Framework establishes the direction of the school district. The framework is supported by the annual budget, which is simply the resource strategy behind the Strategic Framework. The budget process begins with a thorough review of district priorities, current spending patterns, and outcomes. The zero- based budget process requires a critical examination of all budget practices and how those practices influence resource deployment. Based upon our budget work thus far, we believe there are opportunities to make the staffing process more responsive to individual school needs, to shift non- personnel resources from central office budgets to school budgets, and to improve budget accuracy by clarifying and simplifying account structures. 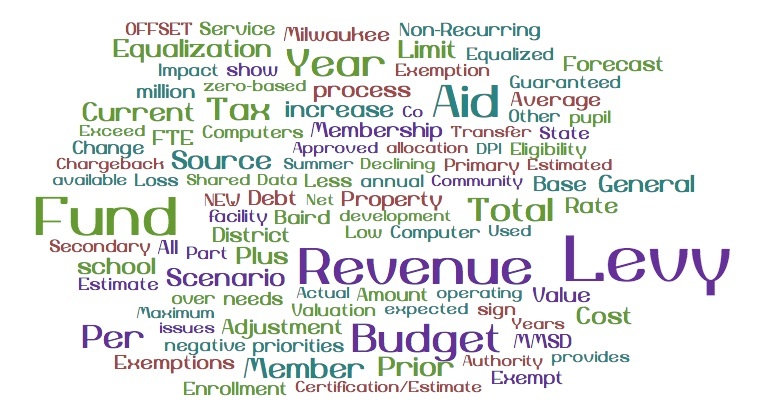 We’re excited to explore these and other opportunities throughout the 2014-15 budget process. A zero-based approach is being used to develop the expenditure budget. Unlike an ‘historical cost’ budget or a ‘cost to continue’ budget, the zero-based process is intended to go beyond marginal refinements of existing budgets and existing structures. 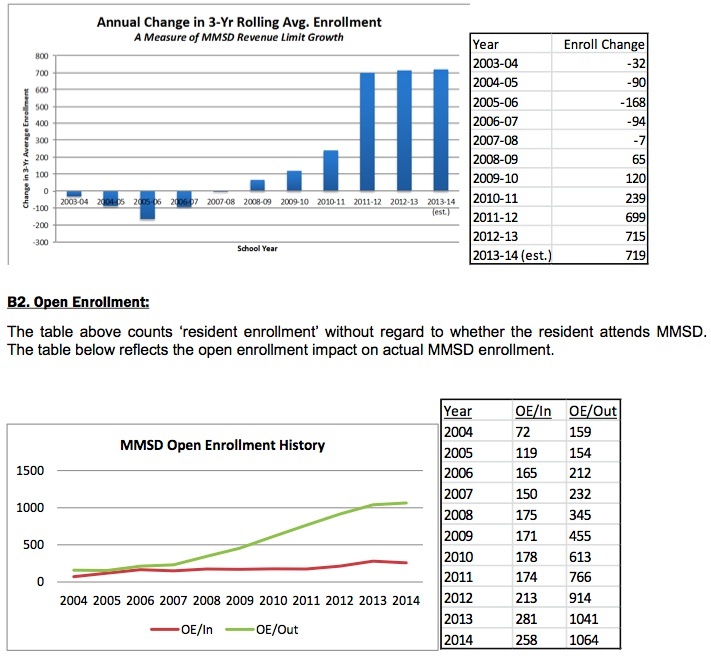 For example, MMSD has used essentially the same staffing allocation process for over ten years under the ‘cost to continue’ approach, with only minor modifications along the way. While the existing allocation process is uniform and consistent, it can be improved by making it more responsive to the challenges presented by individual schools. The senior leadership team, with input from the principals, is assessing the staffing allocation process this month before any allocation decisions are put into motion in February. The existing staff allocation process consists of a series of departmental layers, with separate staffing allocations for regular education, special education, Title 1, OMGE, pupil services, PBS, etc. We are hopeful that a more integrated and responsive staffing allocation process, beginning this year and refined continuously in subsequent years, will produce a more tailored fit for each school. The zero-based approach is designed to uncover such opportunities. The zero-based process also includes in-depth reviews of each central office department. We are particularly interested in identifying inter-departmental overlaps, gaps, and even redundancies. We are optimistic that this effort will produce new efficiencies and help push resources from the district office into the schools. The resource decisions contained in the annual budget are subject to continuous review, either directly through the zero-based budget process, or indirectly through the SIP process, district surveys, targeted studies (such as the Principal Pipeline study [PDF] and High School Reform study), and several active advisory committees. These are the sources which inform the budget development process. The Strategic Framework identifies five key priorities which are aimed at providing schools with the tools, processes and resources they need to serve children and their families better than ever before. 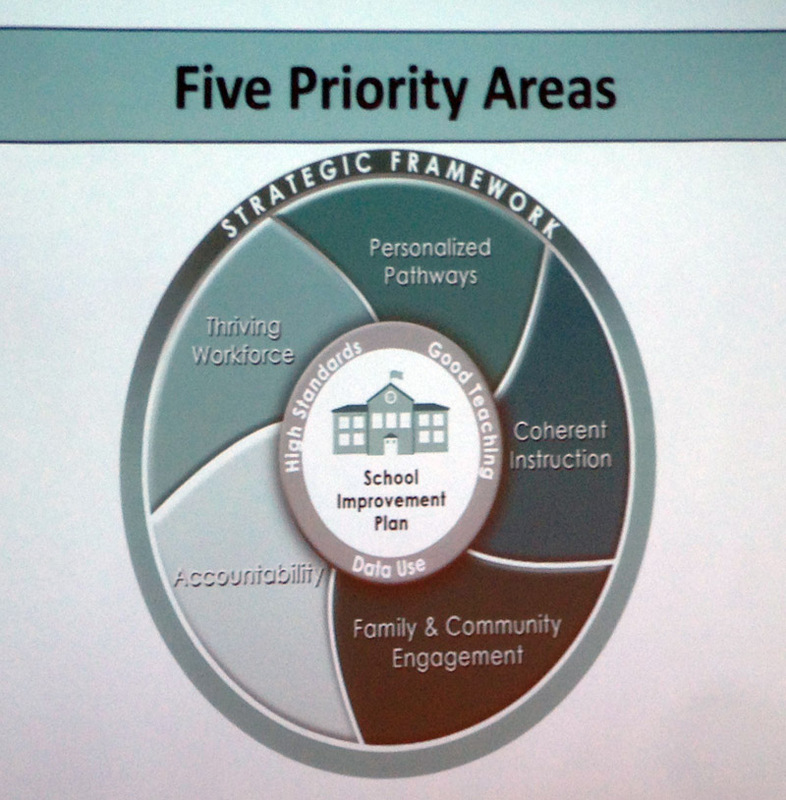 The five priorities are: (1) Coherent Instruction, (2) Personalized Pathways, (3) Family and Community Engagement, (4) A Thriving Workforce, and (5) Accountability at All Levels. Each of the priorities in the Strategic Framework includes a set of high-leverage actions that have cost implications. A preview of some of the major actions with cost implications, organized by Priority Area, will be developed and refined throughout the budget development process. A preview of the major actions will be presented to the Operations Work Group along with this Budget Forecast. 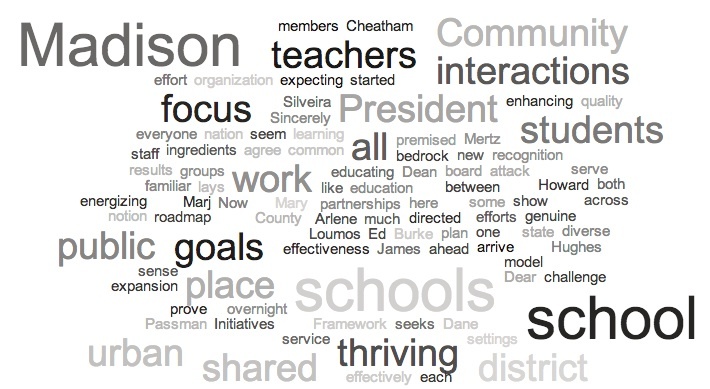 The word cloud is interesting, particularly in light of the District’s job number one, addressing its long term disastrous reading results. Related: numerous links on the District’s 2013-2014 budget, here. Madison spends about twice the national average per student ($15k). The district provided a comprehensive extended learning summer school program, K-Ready through 12th grade, at ten sites and served 5,097 students. At each of the K-8 sites, there was direction by a principal, professional Leopold, Chavez, Black Hawk and Toki, and oral language development was offered at Blackhawk and Toki. The 4th grade promotion classes were held at each elementary school, and 8th grade promotion classes were held at the two middle school sites. Students in grades K-2 who received a 1 or 2 on their report card in literacy, and students in grades 3-5 who received a 1 or 2 in math or literacy, were invited to attend SLA. The 6-7 grade students who received a GPA of 2.0 or lower, or a 1 or 2 on WKCE, were invited to attend SLA. As in 2012, students with report cards indicating behavioral concerns were invited to attend summer school. Additionally, the summer school criterion for grades 5K-7th included consideration for students receiving a 3 or 4 asterisk grade on their report card (an asterisk grade indicates the student receives modified curriculum). In total, the academic program served 2,910 students, ranging from those entering five-year-old kindergarten through 8th grade. High school courses were offered for credit recovery, first-time credit, and electives including English/language arts, math, science, social studies, health, physical education, keyboarding, computer literacy, art, study skills, algebra prep, ACT/SAT prep, and work experience. The high school program served a total of 1,536 students, with 74 students having completed their graduation requirements at the end of the summer. All academic summer school teachers received approximately 20 hours of professional development prior to the start of the six-week program. Kindergarten-Ready teachers as well as primary literacy and math teachers also had access to job embedded professional development. In 2013, there were 476 certified staff employed in SLA. A) Provide teachers with a pay increase without increasing overall cost of summer school. Teacher salary increase of 3% ($53,887). A) Professional development (PD): reduce PD days for teachers grades K-8 by one day. This change will save money and provide teachers with an extra day off of work before the start of summer school (save $49,344.60). B) Materials reduction: the purchase of Mondo materials in 2013 allows for the reduction of general literacy curricular materials in 2014 (save $5,000). C) Madison Virtual Campus (MVC): MVC is not a reimbursable summer school program as students are not in classroom seats. This program could be offered separate from summer school in the future (save $18,000). D) Librarians: reduce 3 positions, assigning librarians to support two sites. Students will continue to have access to the expertise of the librarian and can utilize library resources including electronic equipment (save $12,903.84). E) Reading Interventionists: reduce 8 positions, as summer school is a student intervention, it allows students additional learning time in literacy and math. With new Mondo materials and student data profiles, students can be grouped for the most effective instruction when appropriate (save $48,492). F) PBS Coach: reduce 8 positions, combining the coach and interventionist positions to create one position (coach/interventionist) that supports teachers in setting up classes and school wide systems, along with providing individual student interventions. With smaller learning sites, there would be less need for two separate positions (save $24,408). G) Literacy and Math Coach Positions: reduce from 16 to 5 positions, combining the role and purpose of the literacy and math coach. Each position supports two schools for both math and literacy. Teachers can meet weekly with literacy/math coach to plan and collaborate around curriculum and student needs (save $27,601.60). 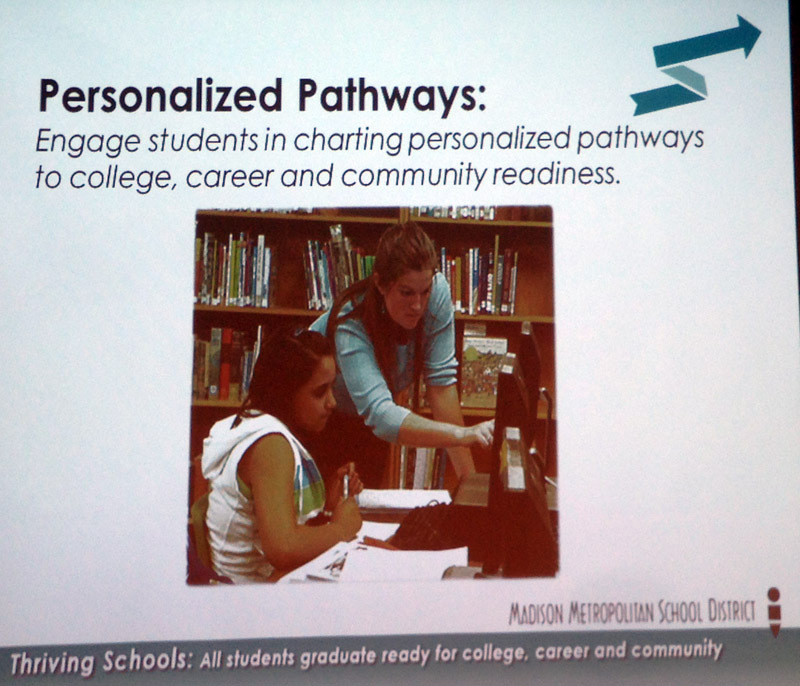 A) Every student is on-track to graduate as measured by student growth and achievement at key milestones. Milestones of reading by grade 3, proficiency in reading and math in grade 5, high school readiness in grade 8, college readiness in grade 11, and high school graduation and completion rate. B) Every student has access to challenging and well-rounded education as measured by programmatic access and participation data. Access to fine arts and world languages, extra-curricular and co-curricular activities, and advanced coursework. 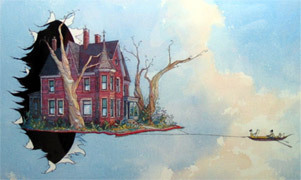 Jennifer Cheatham doesn’t have the countenance of someone who has stepped into a maelstrom. Madison schools superintendent since April, Cheatham, 41, has already visited every school in the district and rolled out a “Strategic Framework” to tackle some of the district’s thorniest issues, including the achievement gap. So far she’s generated considerable excitement around her plans and raised hopes, even among skeptics. Kaleem Caire has even put off plans to file a federal civil rights complaint against the district for the school board’s rejection of a charter school geared toward low-income minority students. The CEO of the Urban League of Greater Madison, which spearheaded the proposal, says he’s now content to play a “facilitative, supportive role” and get behind Cheatham’s plan to “bring order and structure” to the district. “Personally, I’ve been hanging back, letting her get her space,” says Caire. “The superintendent should be the leader of education. All of us should be supporting and holding that person accountable. 90 Schools (2 in Dane County) Apply to Join Wisconsin Voucher Program; Madison Schools Governance Dichotomy? Public education is under sustained attack, both in our state and across the nation. Initiatives like voucher expansion are premised on the notion that public schools are not up to the challenge of effectively educating diverse groups of students in urban settings. We are out to prove that wrong. 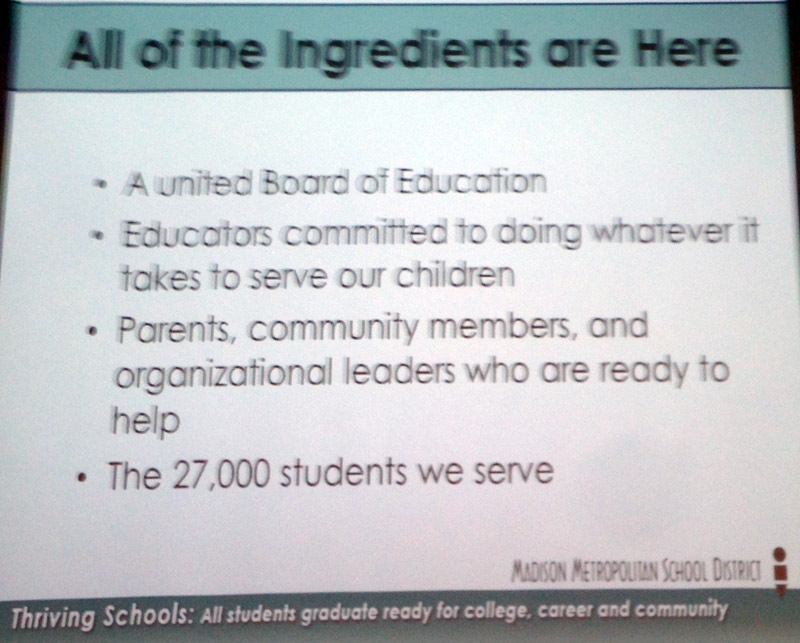 With Superintendent Cheatham, we agree that here in Madison all the ingredients are in place. Now it is up to us to show that we can serve as a model of a thriving urban school district, one that seeks out strong community partnerships and values genuine collaboration with teachers and staff in service of student success. Our Strategic Framework lays out a roadmap for our work. While some of the goals will seem familiar, what’s new is a clear and streamlined focus and a tangible and energizing sense of shared commitment to our common goals. 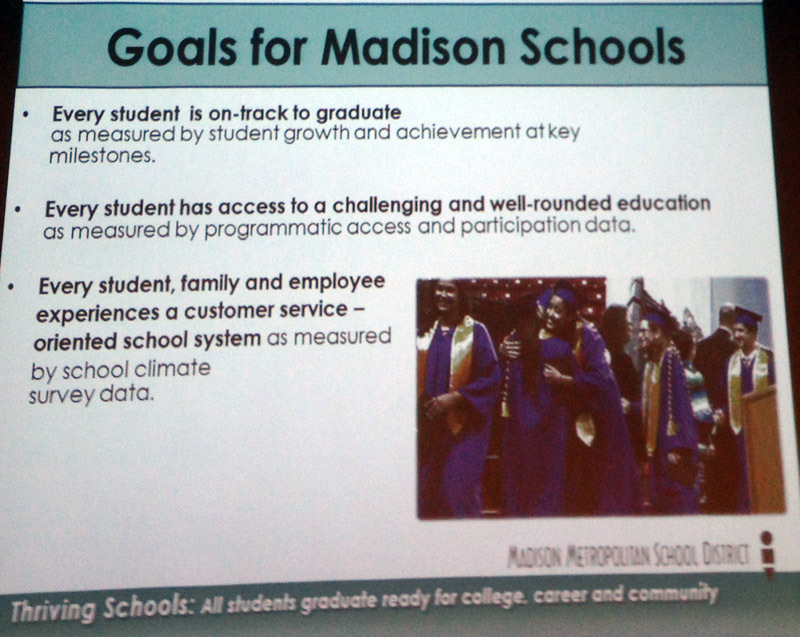 Madison must focus, laser like on academic achievement. The Dichotomy of Madison School Board Governance: “Same Service” vs. “having the courage and determination to stay focused on this work and do it well is in itself a revolutionary shift for our district”. The dichotomy that is Madison School Board Governance was on display this past week. Tax expenditures are not tax cuts. Tax expenditures are socialism and corporate welfare. Tax expenditures are increases on anyone who does not receive the benefit or can’t hire a lobbyist…to manipulate the code to their favor. be applied to certain school volunteers. This proposal represents a continuation of the Districts’ decades long “same service” approach to governance, with declining academic results that spawned the rejected Madison Preparatory IB Charter School. 2. Madison’s new Superintendent, Jennifer Cheatham introduced her “Strategic Framework” at Wednesday’s Downtown Rotary Club meeting. Rather than present our educators with an ever-changing array of strategies, we will focus on what we know works and implement these strategies extremely well. While some of the work may seem familiar, having the courage and determination to stay focused on this work and do it well is in itself a revolutionary shift for our district. 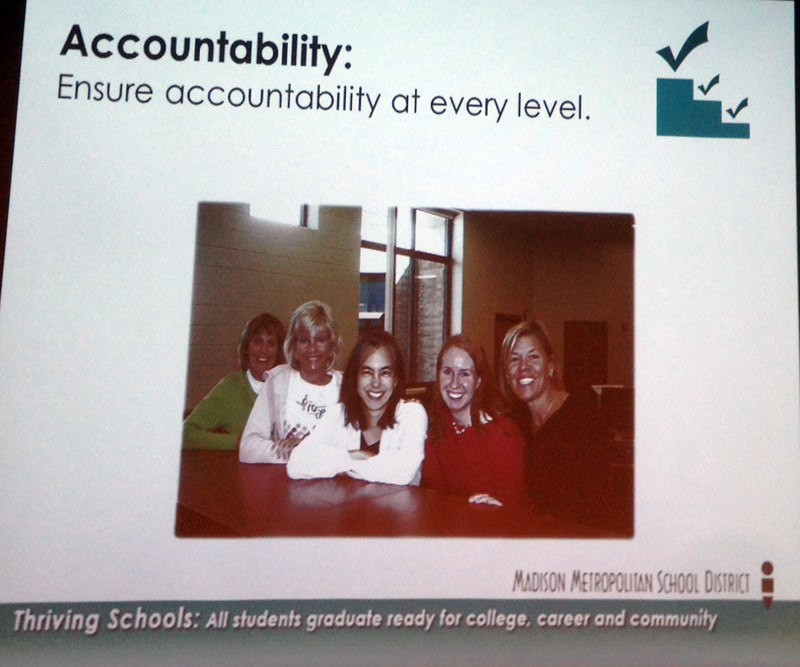 This is what it takes to narrow and eliminate gaps in student achievement. The bedrock of the plan is the recognition that learning takes place in the classroom in the interactions between teachers and students. The efforts of all of us – from school board members to everyone in the organization – should be directed toward enhancing the quality and effectiveness of those interactions. There is much work ahead of us, and the results we are expecting will not arrive overnight. But with focus, shared effort and tenacity, we can transform each of our schools into thriving schools. 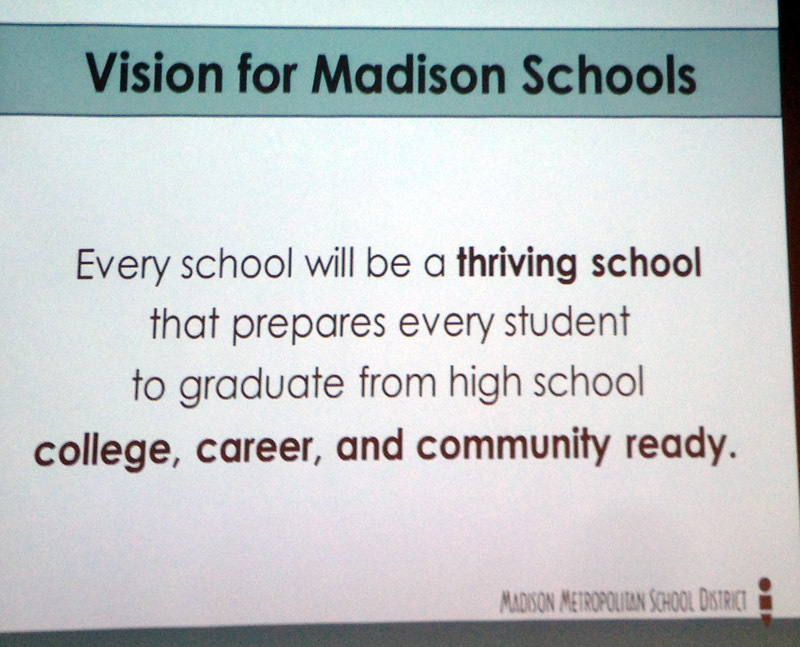 As we do so, Madison will be the school district of choice in Dane County. North Carolina Gov. Pat McCrory, a Republican, signed a budget bill Friday that eliminates teacher tenure and–in a rare move–gets rid of the automatic pay increase teachers receive for earning a master’s degree. The legislation targets a compensation mechanism that is common in the U.S., where teachers receive automatic pay increases for years of service and advanced degrees. Some research has suggested those advanced degrees don’t lead to improved teaching. Although a few other states have talked about doing away with the automatic pay increase for advanced degrees, experts say North Carolina is believed to be the first state to do so. The budget bill–which drew hundreds of teachers to the Capitol in protest earlier this week–also eliminates tenure for elementary and high-school teachers and freezes teacher salaries for the fifth time in six years. It comes as states and districts across the country are revamping teacher evaluations, salaries and job security, and linking them more closely to student performance. These changes have been propelled, in part, by the Obama administration and GOP governors. The challenge for Madison is moving away from long time governance structures and practices, including a heavy (157 page pdf & revised summary of changes) teacher union contract. 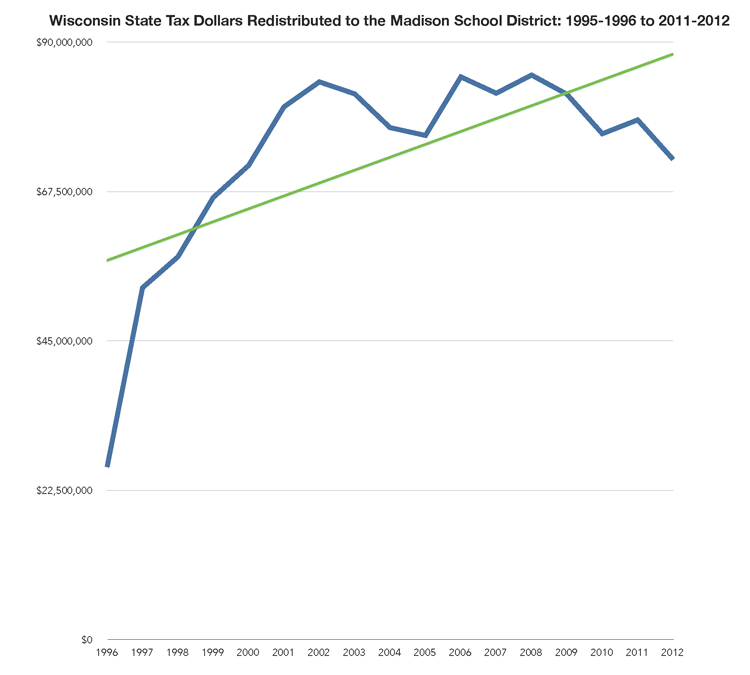 Chris Rickert’s recent column on Madison’s healthcare practices provides a glimpse at the teacher – student expenditure tension as well. “Budget Cuts: We Won’t Be as Bold and Innovative as Oconomowoc, and That’s Okay”. No mention of total spending…. How might the Board exercise its oversight obligation without the entire picture? The substantial increase in redistributed state tax dollars (due to 4K) last year is not mentioned. Rather, a bit of rhetoric: “The 2013-14 budget development process has focused on actions which begin to align MMSD resources with the Strategic Framework Priorities and strategies to manage the tax levy in light of a significant loss of state aid.” In fact, according to page 6, the District expects to receive $46,392,012 in redistributed state tax dollars, which is a six (6%) increase over the funds received two years ago. The District’s fund equity (financial cushion, or reserves) has more than doubled in the past eight years, from $22,368,031 in 2005 to $46,943,263 in 2012. Outbound open enrollment continues to grow, up 14% to 1,041 leavers in 2013 (281 inbound from other Districts). 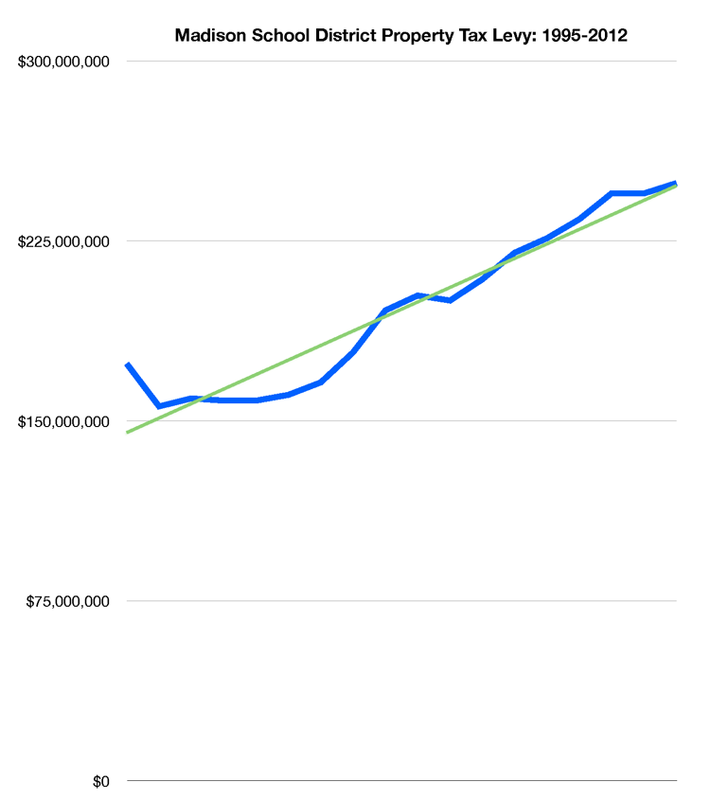 The growth in Fund 80 (MSCR) property taxes and spending has been controversial over the years. 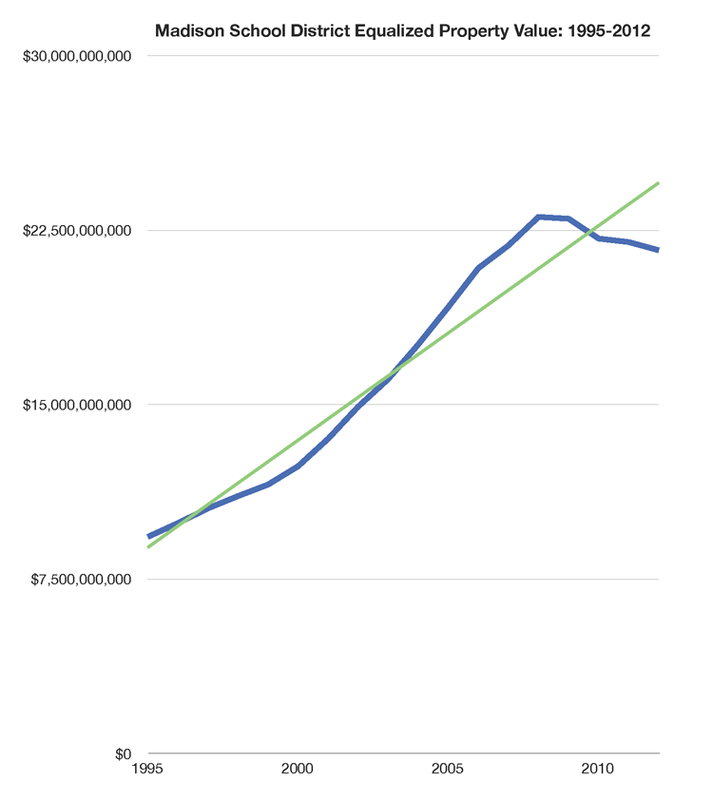 Fund 80, up until recently was NOT subject to state imposed property tax growth limitations. The January, 2012 budget document mentioned “District spending remains largely flat at $369,394,753” (2012-2013), yet the “baseline” for 2013-2014 mentions planned spending of $392,807,993 “a decrease of $70,235 or (0.02%) less than the 2012-13 Revised Budget” (around $15k/student). The District’s budget generally increases throughout the school year, growing 6.3% from January, 2012 to April, 2013. Follow the District’s budget changes for the past year, here. Work will begin on the 2014-15 early this fall. The process will be zero-based, and every line item and FTE will be carefully reviewed to ensure that resources are being used efficiently. The budget development process will also include a review of benefit programs and procurement practices, among other areas. One hopes that programs will indeed be reviewed and efforts focused on the most urgent issues, particularly the District’s disastrous reading scores. Ironically, the recent “expert review” found that Analysis: Madison School District has resources to close achievement gap. If this is the case (and I agree with their conclusion – making changes will be extraordinarily difficult), what are students, taxpayers and citizens getting for the annual tax & spending growth? 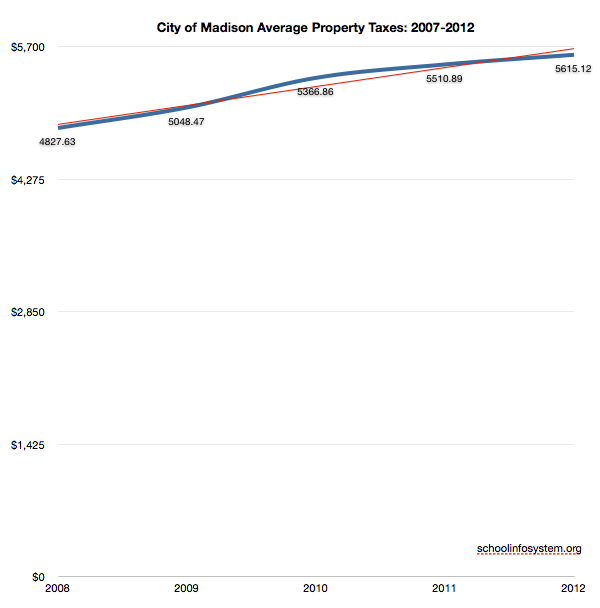 I took a quick look at property taxes in Middleton and Madison on a $230,000 home. 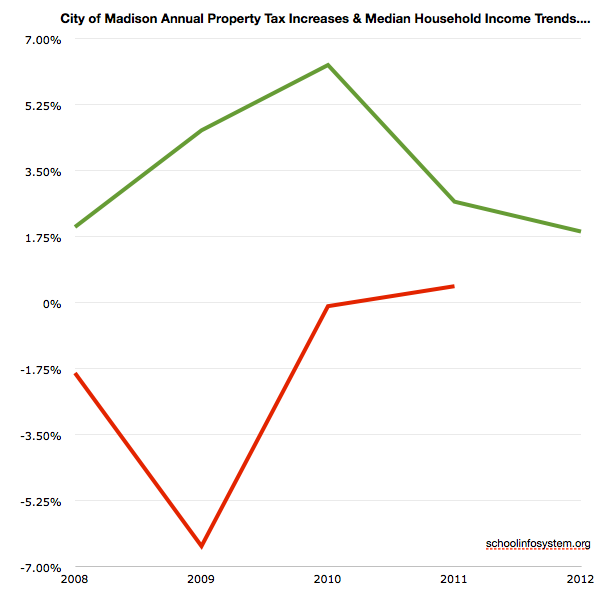 A Middleton home paid $4,648.16 in 2012 while a Madison home paid 16% more, or $5,408.38. Madison School District Administration (PDF): 8:00 Opening Remarks 8:15 Dialogue: Decision-making for Equity EquityPolicyBeliefStatementRevisions 9:15 BREAK 9:30 Dialogue: Five Year Outlook, school year 17/18 focus Re-entry Planning 17/18 focus areas 17/18 District & SIP Goals 10:15 Strategic Framework Priority Project Update & Discussion 11:15 Closing Remarks 11:30 Lunch February 18, 2017 agenda (PDF). Meeting Objectives 1. Reflect on the National Equity Project work 2. Review Strategic Framework implementation progress through an equity lens 3. Update the Board on the Priority 3: Family, Youth, and Community Engagement theory of action 4. Discuss strategy examples: Report Cards Meeting Handouts Targeted Universalism Madison has long tolerated disastrous reading results. 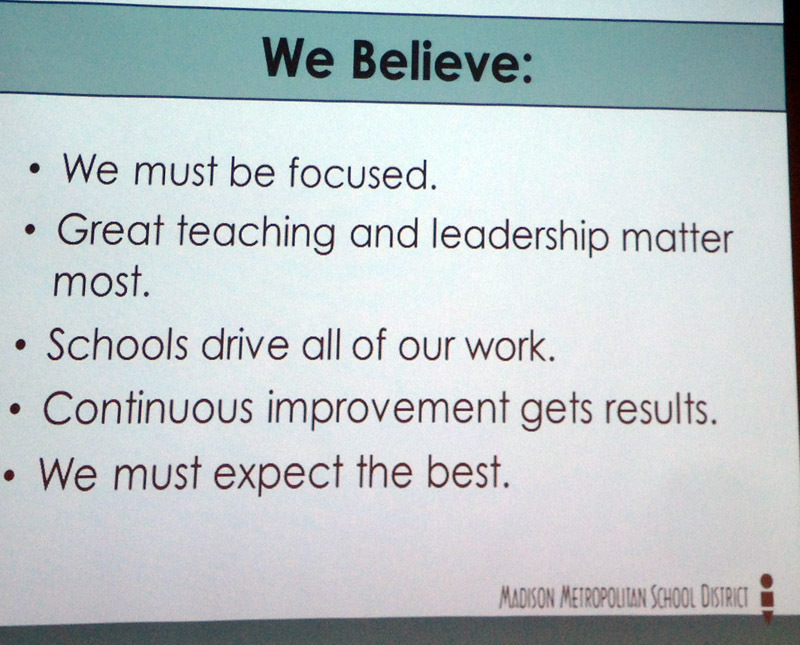 Superintendent Cheatham’s slides follow (4MB PDF version). 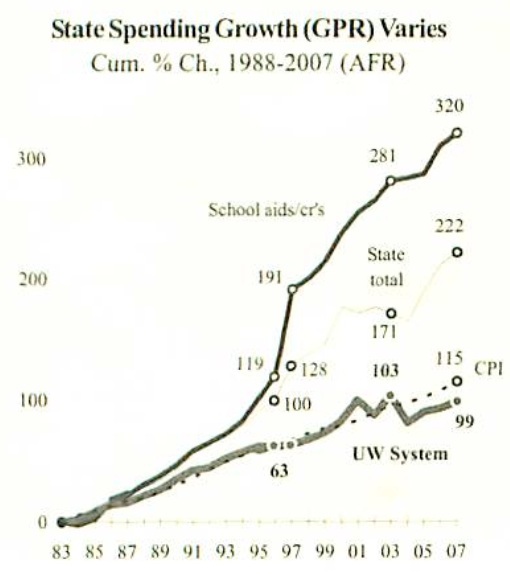 I hope that the prominence of Madison’s disastrous reading scores – slide 1 – indicates that this is job one for our $15,000ish/student organization. 1. “What will be different this time?” That rhetoric is appropriate for our Madison schools. I compiled a number of notes and links on this subject, here. 2. “Ready to partner with local businesses and other organizations”. Great idea. The substance of this would certainly be a change after the Madison Preparatory Academy IB Charter school debacle (Urban League) and, some years ago, the rejection of Promega’s kind offer to partner on Madison Middle Schools 2000. 3. Mentions “all Madison schools are diverse”. I don’t buy that. The range of student climate across all schools is significant, from Van Hise and Franklin to LakeView, Mendota and Sandburg. 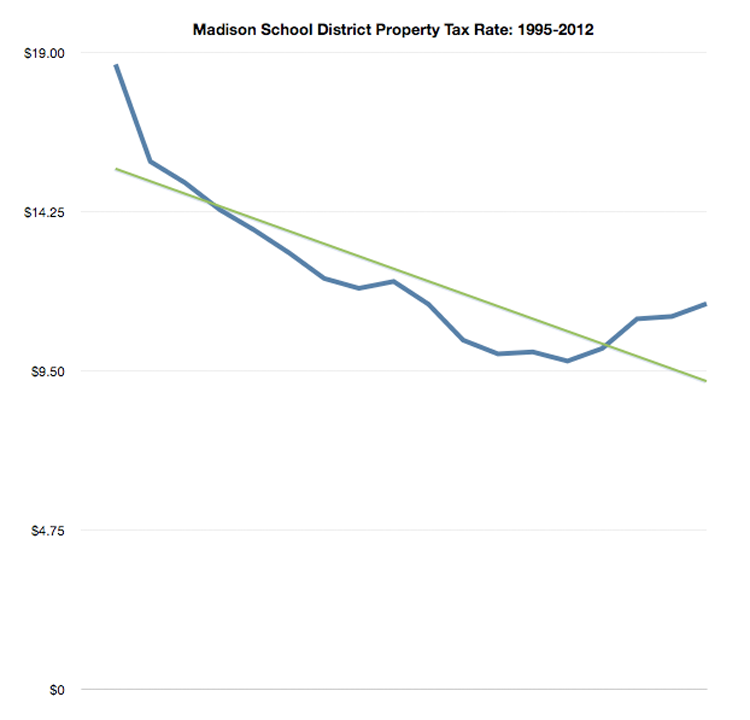 Madison school data by income summary. I have long been astonished that this wide variation continues. 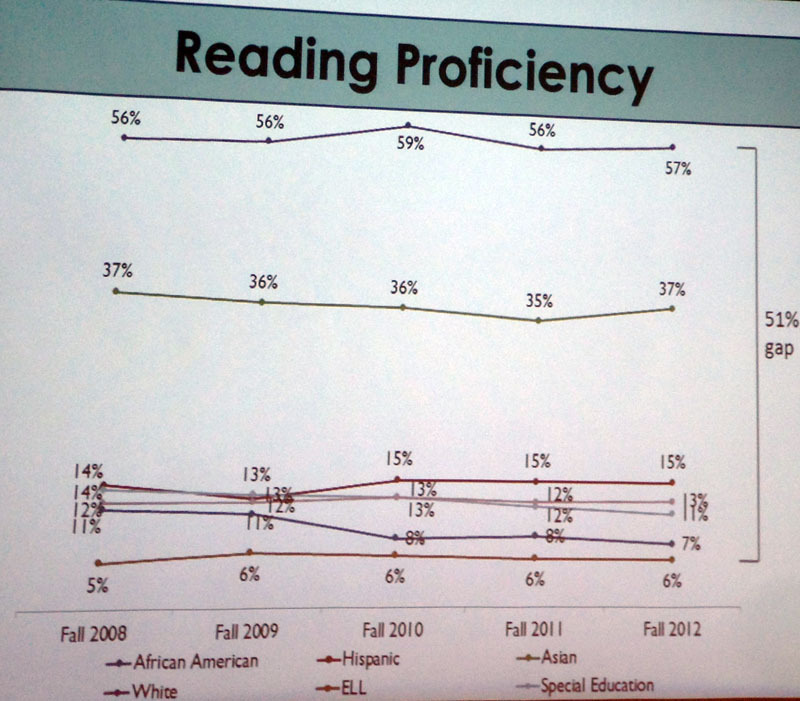 Note that Madison’s reading problems are not limited to African-American students. 4. Mentioned Long Beach and Boston as urban districts that have narrowed the achievement gap. Both districts offer a variety of school governance models, which is quite different than Madison’s long-time “one size fits all approach”. 5. Dave Baskerville (www.wisconsin2.org) asked a question about benchmarking Madison students vs. the world, rather than Green Bay and Milwaukee. Superintendent Cheatham responded positively to that inquiry. Interestingly, the Long Beach schools prominently display their status as a “top 5 school system worldwide”. 6. “Some teachers and principals have not been reviewed for as long as 7 years”. This points to the crux of hard decision making. Presumably, we are at this point because such reviews make no difference given rolling administrator contracts and a strong union umbrella (or floor depending on your point of view). Thus, my last point (below) about getting on with the hard decisions which focus the organization on job number one: reading. Pat Schneider and Matthew DeFour summarize the Superintendent’s press release and appearance. This would be a great time to eliminate some programs such as the partially implemented Infinite Campus system. Superintendent Cheatham’s plan indicates that choices will be made so that staff and resources can focus on where they are most needed. I wholeheartedly agree. There is no point in waiting and wasting more time and money. Delay will only increase the cost of her “strategy tax“. Each year, the Board of Directors performs a formal evaluation of the Superintendent’s performance. 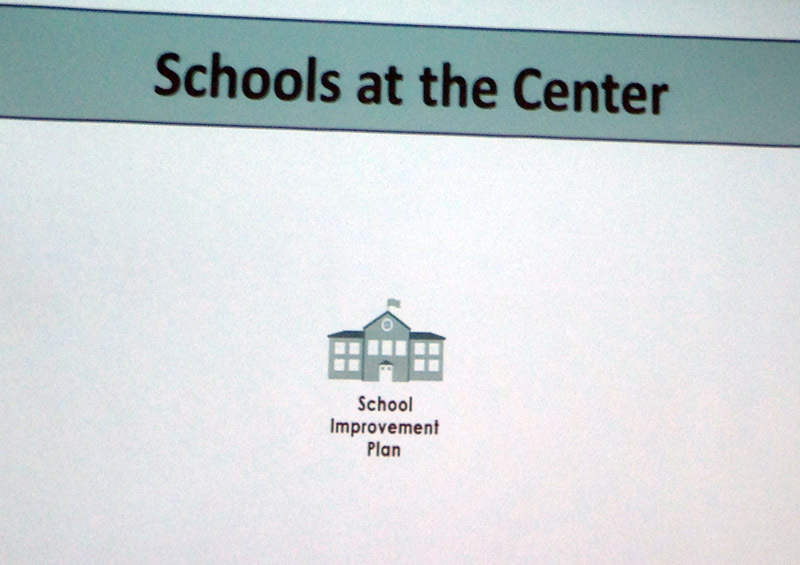 The evaluation is based upon goals adopted by the School Board in November 2012. 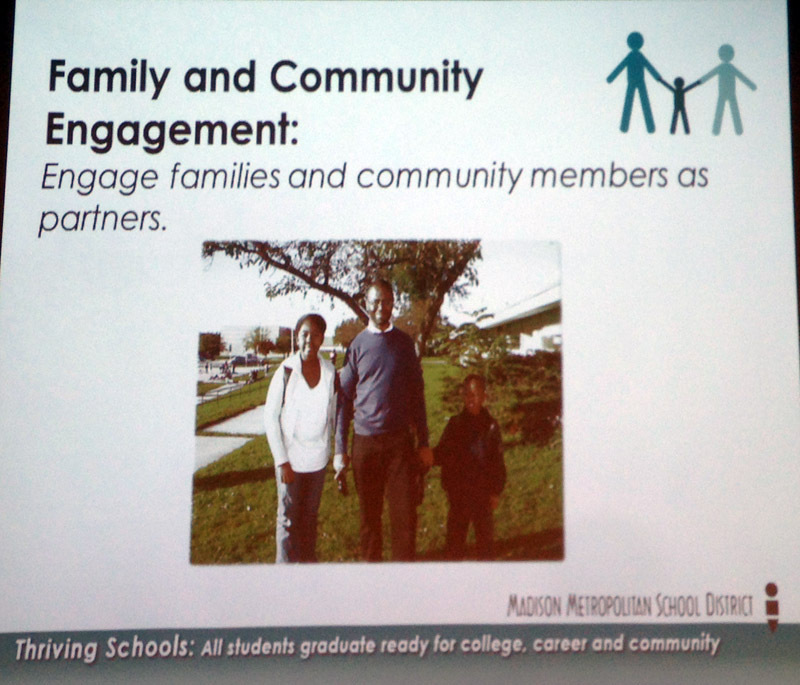 Building relationships with selected stakeholders to connect them to our schools: Family engagement, Labor Partners and community based organizations. The Superintendent was evaluated based upon the agreed on evaluation criteria. 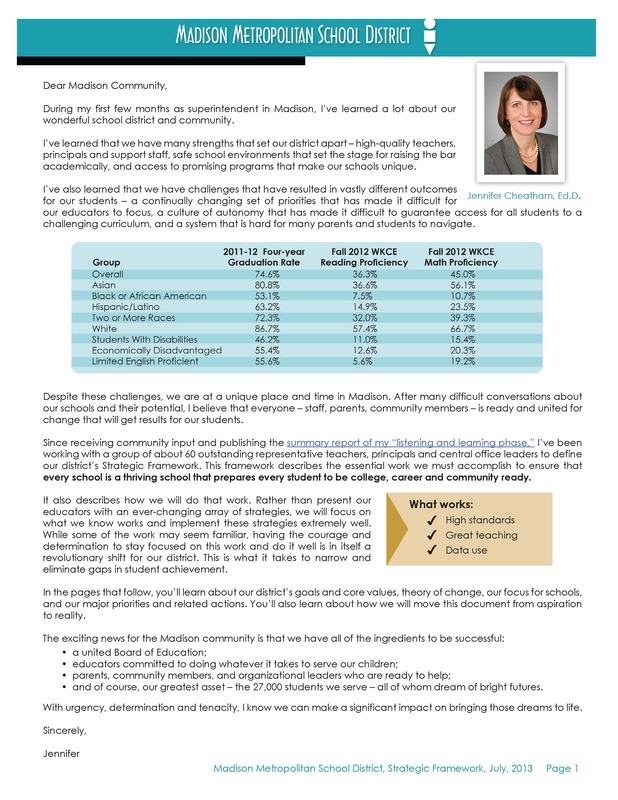 The Superintendent issued a report to the Board, which is attached, detailing performance during the last year. 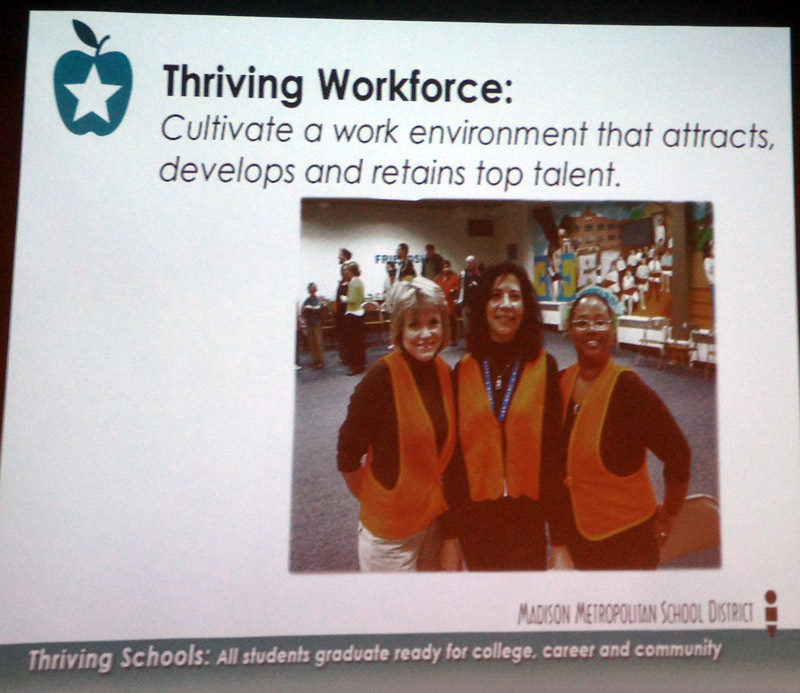 The District retained Robin Boehler, of Mercer Island Group, to facilitate the evaluation process. Ms. Boehler interviewed each Director, as well as the key senior staff. The evaluation ratings of Mr. Banda were evaluated using a numeric rating system. These are the same ratings used for classified employees in the District. The ratings were made using a five point rating system with a numeric rating of five as “Outstanding”; four is described as “Exceeds Expectations”, three is described as “Meets Expectations”, two is “Below Expectations” and one is “Unsatisfactory”. The last Talented and Gifted (TAG) Education Plan was adopted by the MMSD Board of Education in 1991. With state statute and policy reform, alignment with current District strategic planning, and a desire to utilize research in exemplary practice, approval of a comprehensive Talented and Gifted Plan has become a District priority. This document is meant to be a guide as the Division aims to achieve its mission in alignment with the MMSD Strategic Plan, the State of Wisconsin statutes and administrative rules for gifted and talented education, and the National Association for Gifted Children standards. There will be a review of the Plan, with status reports issued to the Board of Education, in January and June 2010. Adjustments to the Plan will be documented at that time. Wisconsin State Statute 121.02(1) (t), and Administrative Rule PI 8.01(2)(t).2 require school districts to identify those students who give evidence of high performance capability as talented and gifted and provide those students with access to appropriate systematic and continuous instruction. The National Association for Gifted Children (NAGC) standards complements the Wisconsin framework and provides a guide for quality educational programming. The Plan below identifies the following categories as areas in need of improvement in MMSD Talented and Gifted Programming. The primary focus in developing this Plan has been in the areas of identification, programming, and professional development. 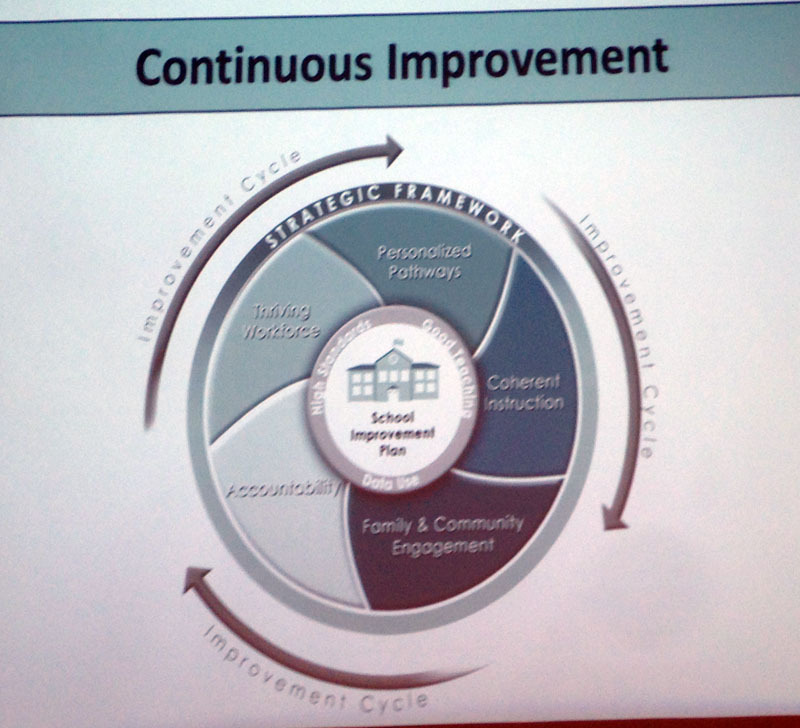 A new Strategic Plan was developed through extensive community involvement. 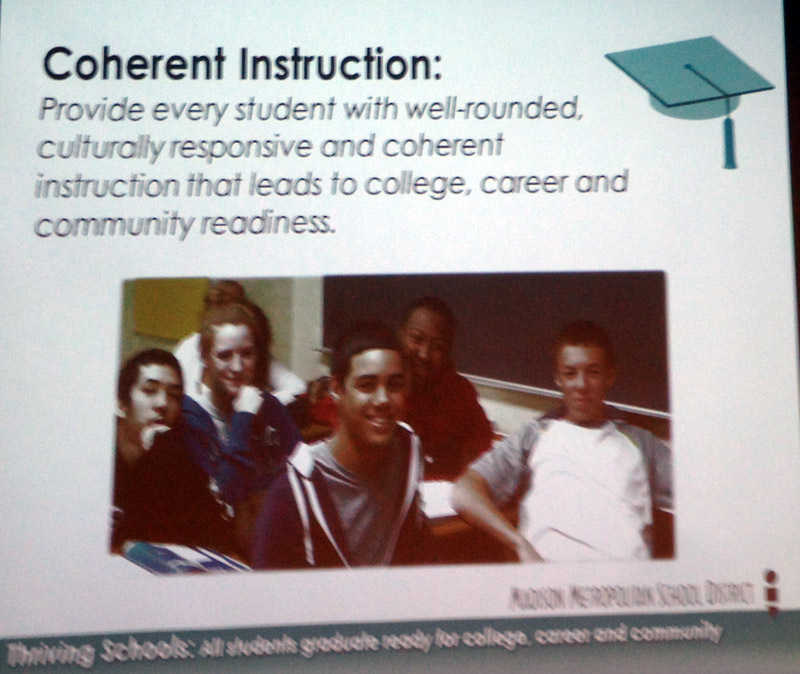 The Strategic Plan clearly demands a rigorous and challenging education for all students. Process In response to the events described above, the Superintendent charged the Teaching & Learning TAG Division to develop a process to create an updated Plan. The TAG Division met on a regular basis to define major areas for improvement in alignment with the National Association for Gifted Children standards. A Talented and Gifted Advisory Committee comprised of 30 members was convened in early spring. This group met five times between February and June to provide input and critique the evolving draft. The Superintendent and TAG Coordinator hosted a community input session on March 26. Senior Management, Instructional Council and Principals reviewed drafts and provided input. In order to ensure a timely and high quality Plan, a subcommittee of the Talented and Gifted Advisory Committee was invited to continue to work with TAG staff to complete the Plan during June and July. There have been significant challenges in the process leading to the development of the enclosed plan. 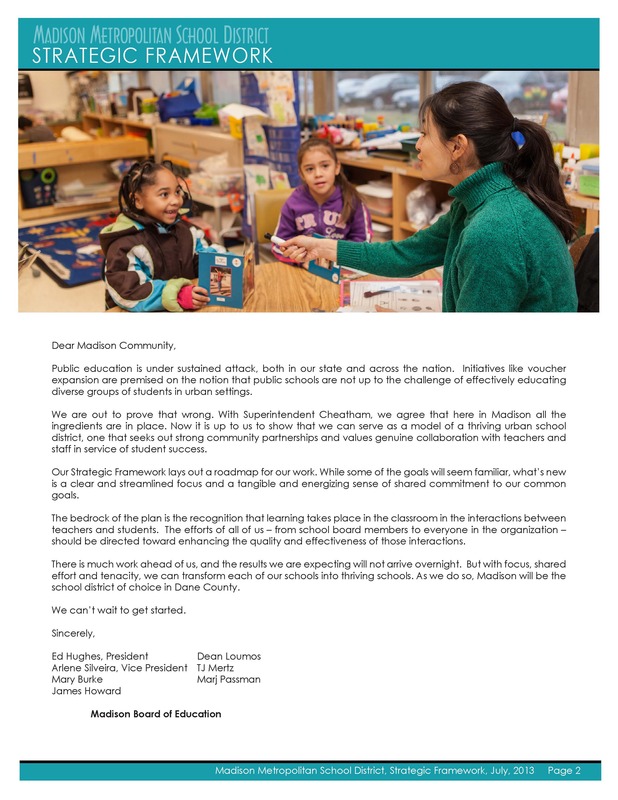 These challenges include communication, changes in leadership and an evolving level of District and community trust in MMSD’s commitment to providing high quality education for all stUdents. Overcoming these challenges is an on-going process, one captured in the language of the plan with respect to continual improvement. Although there are aspects of current MMSD talented and gifted programming that are sound and valued, the need for overall structural improvements and re-vitalization is recognized byal!. In addition to the TAG Division staff, we sincerely appreciate the members of the TAG Advisory Committee for their extraordinary gift of time and dedication toward creating this plan. Special recognition goes to TAG Advisory Subcommittee members Kerry Berns, Bettine Lipman, Laurie Frost, Chris Gomez Schmidt and Carole Trone for their continuing support and input through the final draft of this plan. MMSD Strategic Planning The enclosed TAG Plan aligns, supports and strengthens important aspects of the Strategic Plan. In particular, the TAG Plan undergirds District-wide efforts to: enhance assessments to guide appropriate levels of instruction; accelerate learning for all students; embed differentiation as core practice in all classrooms; and map and develop a comprehensive and articulated curriculum K-12 in order to increase curricular rigor for all students. While Wittig did not have a degree in education, she did have some college-level credits in education and a “background of training others to perform accurately and competently in my numerous job positions, beginning in my high school years.” That experience was enough for her to sense something was wrong. She was not easily brushed off by assurances that her children were being taught “whole language skills.” For two years, she agonized before transferring her children from New Berlin’s public schools to private schools. After only a semester at the private schools, her children were writing and reading at a markedly higher level. Their papers were neatly written, grammatical, and their spelling was systematically corrected. Earlier this year, she decided to take her story to her local school board. Better MMSD budget process? Maybe next year.